The buildings that appear here were chosen for unique architectural details, some for how they typify their town, region or Texas in general, and some simply because they happen to be the last remaining building of a particular town or community. Fredericksburg - Replica of "Vereins Kirche" or "Society's Church"
Rabbi Henry Cohen (1863-1952) - Rabbi of Galveston's Temple B�nai Israel, provided a place for thousands of Jewish immigrants routed through the port of Galveston. In 1878 a rather slightly built man with blue-gray eyes came to Fort Davis, Texas. He was a native of Tennessee and an ordained Presbyterian minister. The man�s name was William B. Bloys. While a lot of folks have heard about another denizen of the trans-Pecos, Roy Bean, William B. Bloys was far more influential, though far less widely known. The Holy Oak - An image of Jesus in the end of the limb. "... In their day, which ran roughly from the 1860s to just after the turn of the century, the Sanctified Sisters existed as one of the most unusual and, in their own way, influential religious groups in Bell County history..."
"... In addition to whatever they might put in the collection plate each week, many farmers used to give the proceeds from one acre of their crop land to their church each year. 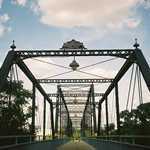 Though not as common as it used to be, the tradition has endured in some corners of Texas..."
"... In the 1820s, Daniel Parker, an anti-missionary Baptist leader and member of the Parker clan that produced Cynthia Ann, stirred up Baptists in Illinois with his separatist beliefs and eventually led his family and neighbors to East Texas to write a new religious chapter in Texas history..."
"... Samuel Doak McMahon held the first meeting of Methodists in Texas in his home, located ten or so miles east of San Augustine, in 1832, but the arrival of Littleton Fowler in 1837 was the first authorized Methodist activity there..."
For longer than anyone can remember, the story of �the lady in blue� has existed on the fringes of East Texas history and religion. When the church decided to phase out the old kerosene lights for safety reasons, Clark went to Jefferson Lighting Company of Ann Arbor, Michigan, and told them what he wanted..
John Wesley Kenney - (1799-1865) "One of great pioneer Methodist ministers of Texas"
"A central figure in the early days of Texas Methodism..."